Kathy Marrs is an Associate Professor of Biology in the School of Science at IUPUI. 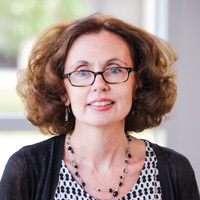 She has served in several administrative roles on campus, including Associate Dean for Academic Affairs, Director of UCASE (the Urban Center for the Advancement of STEM Education) and Director of the Woodrow Wilson Indiana Teaching Fellowship at IUPUI. She teaches Introductory Biology for ~1000 science majors per year, and also teach Honors Introductory Biology, where we have developed authentic research projects for students based on research interests of our Biology faculty. She team-teaches an interdisciplinary Themed Learning Community (TLC) with a colleague from Chemistry, and collaborate on two additional TLCs in Neuroscience and in Biomedical Engineering. She teaches a project-based Microbiology lab, working with Microbiology and Organic Chemistry colleagues on a Distributed Drug Discovery program (D3) to find drug leads for rare and neglected disease. She also teach two courses in the School of Education for secondary science teachers. She was selected as a Mosaic Fellow to implement research-based approaches to active and collaborative learning in technology classrooms. Her research has focused on a range of educational initiatives from K-12 outreach, undergraduate education, graduate education, and teacher preparation, funded through a number of National Science Foundation programs (NSF GK-12, NSF Noyce, NSF STEP, NSF CCLI and NSF TUES).